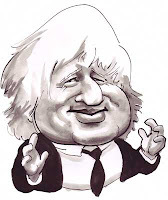 Boris Johnson was born on 19 June 1964 in New York City, USA. He attended school in Brussels (European School) and later went to the prestigious Eton College. He then moved on to Balliol College, Oxford, to read classics. At the same time he became the President of the Oxford Union, a debating society. After graduating Boris Johnson started a career in journalism, but he was not successful at first (for instance he worked briefly for The Times before being fired for falsifying a quotation) but was soon hired by The Daily Telegraph where he was not only reporting on the European Community and was later promoted assistant editor. Simultaneously he wrote articles for The Spectator, a British magazine with a conservative editorial line, and from 1999 to 2005 he worked as its editor. Johnson published three books compiling his articles, as well as a comic novel, Seventy-Two Virgins (2004) and plans to release another called The New British Revolution. As to his political career, he first ran for the Conservative Party at the 1997 general election but had to wait until 2001 to be elected MP. Johnson was appointed vice-chairman of the Tories in 2003 and Shadow Minister for the Arts in 2004 but had to resign because he had lied about an affair he had to the former Tory Leader, Michael Howard. However, David Cameron brought him back into grace by promoting him to the position of Shadow Minister for Higher Education in 2005. The year after he run for the election of Rector of the University of Edinburgh, which resulted in a massive campaign against him (“Anyone but Boris”) and he eventually did not got the job. In July 2007 Boris Johnson made public his intention to become Mayor of London and he was soon confirmed as the Conservative candidate. 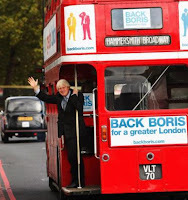 During his campaign he notably promised to reintroduce Routemasters and reduce police presence in public transports, which was criticised as a lack of seriousness. However, Johnson gathered a greater number of votes than his Labour rival, Ken Livingstone, and assumed control at City Hall on 4 May 2008. One of the first measures he announced was a total ban of alcohol on the whole London transport network. Johnson took part several times in such popular TV shows as Have I Got News For You (he was even nominated for a BAFTA Television Award) and Top Gear, and he presented two documentaries (The Dream of Rome and After Rome, about Europe and clashes of civilisations). Here is a fragment from Top Gear, with Jeremy Clarkson commenting on Johnson's "power lap in a reasonably priced car". Boris Johnson can definitely be regarded as a British icon, immediately recognised by his hairstyle, gaffes, statements, and just saying ‘Boris’ automatically refers to the man who is also nicknamed “Boris the Menace”. Although he was (or still is) involved in many controversies, he remains very popular not only as Mayor of the capital and Conservative, but also as a showman.